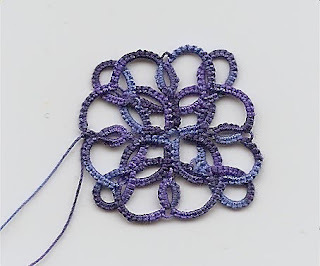 This is from Rosemarie Peel's book "Tatting for Pleasure" and is done in King Tut quilting thread lapis lazuli. By the way, I am not pleased with the way my scanner scans tatting...I turn the brightness down and increase the resolution, but it still seems to come out all shiny. Any suggestions? I don't have any scanning tips, but I do love the motif! I've been thinking about my King Tut thread lately... maybe I'll pull out and play with it. I think I even have that color! I don't have any scanning tips either -- I don't even know how to make adjustments on mine. But, like Diane, I really like that motif. You've done a wonderful job with it. I don't have a scanner, so no tips here, either. Honestly I think the image looks just fine. I don't think it looks all "shiny". Your motif is lovely! Diane, I sometimes think you and I are "tatting twins" we so often share the same ideas! Thank you Marty, and TattingChic, for the compliment. LOL! I wish my scanner would show shine on the thread and not reflect light back in some cases. The motif looks fine in any case. Do you have Microsoft Photo Editor? Open your image, click on "image" and then "balance" and adjust the gamma down -- it takes out the glare for me!